Having good oral hygiene is obviously important for everyone, and it’s especially vital when you have braces. Keeping your teeth and gums clean during your orthodontic treatment is extremely important because improper care and hygiene could lead to prolonged treatment and require more visits. Lack of brushing or even poor brushing can result in unattractive white spots, and even gum disease or tooth decay. When your braces come off, you want to be able to enjoy your new Zaytoun Smile without worrying about tooth decay. You’ll want to brush after every meal (and before bed) to remove food debris and plaque from around your orthodontic appliances. You should be brushing at least three times a day, for at least two minutes each time. You should always use fluoride toothpaste to help prevent cavities and decalcification. You can use a regular toothbrush or an electric one. Whichever one you choose, be sure the head is small and the bristles are soft. 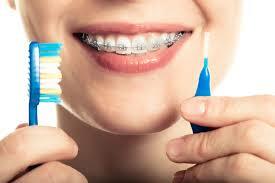 When wearing braces, it may require replacement of toothbrushes more frequently due to the wear and tear on the brush. Floss will help you remove the plaque buildup that your toothbrush can’t get. Braces can make flossing a little more challenging, so you may need to use a floss threader to get the floss underneath the wire. After brushing and flossing, rinse your mouth carefully with water or an over-the-counter or prescription antiseptic mouth rinse to help reduce biofilm and gingivitis (gum inflammation) and minor irritations that can occur with braces. Use your mirror to brush and floss and to check behind your teeth. Also, try using plaque-disclosing tablets once a week so you can see if you’re missing any spots. At Zaytoun Orthodontics, we spend lots of one-on-one time with you at your first appointment, taking the time to review specific tips for keeping your teeth and braces looking and feeling their best. Remember, maintaining excellent oral hygiene when you have braces may take a little extra time and effort, but it will be more than worth it in the end! The Z- Team at Zaytoun Orthodontics is here to help you get the most out of your treatment, and is happy to answer any questions you may have. Three convenient locations- Raleigh, Cary and Garner. Our Signature is Your Zaytoun Smile. Previous Previous post: If My Front Teeth Are Straight, Why Should I Worry About The Others?